From dry eyes, to crusty eyelids, to light sensitivity our office offers drops and supplements to help protect your vision and soothe any irritation. All of the products offered are based on cutting edge research that shows that each of these products deliver results. For specific questions about the products, or to find out which would be the best to treat your individual issues, contact our office today and speak to any of our highly educated staff. 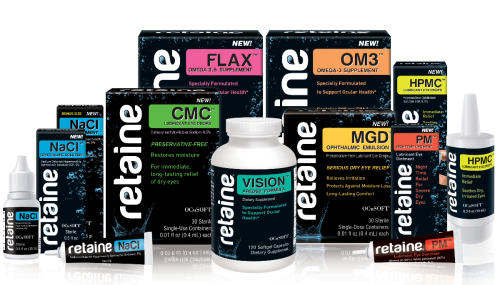 Retaine CMC provides immediate relief for dry, scratchy, irritated eyes which can be caused by excessive heat, air conditioning, reading, medications, or prolonged computer use. Restores moisture with the same healthy quality as natural tears and is preservative-free. 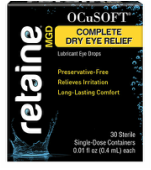 Retaine® HPMC™ Lubricant Eye Drops is a preservative-free solution that provides immediate relief to soothe dry, irritated eyes by resembling natural tears. 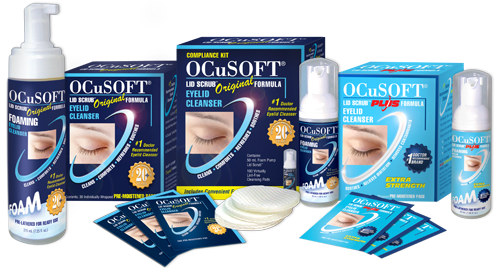 OCuSoft eyelid products offer soothing relief in a easy to apply formula. It effectively removes, oil, debris, pollen and desquamated skin from the eyelids. Ideal for daily eyelid hygiene and mild to moderate conditions. Ocusoft is available as both a foam or a singlet wipe. People grappling with burning, itchy, irritated, or watering eyes now have a proven oral nutritional supplement available to them that starts rapidly relieving these symptoms. EyePromise DVS is the most comprehensive, science-based retinal health formula designed to support blood vessel health – essential in preserving healthy vision – through a unique combination of ingredients with documented effects for eye health. To order EyePromise directly online click the button below!